CHATHAM, ON (Thursday, February 21, 2019) – On Saturday, February 9, the Chatham-Kent Health Alliance Foundation (CKHA) hosted the 8th Annual Charity Curling Classic at the Sydenham Community Curling Club in Wallaceburg. Sixteen highly energetic teams participated and together, the community raised more than $13,500 to help with the purchase of a new transport defibrillator for Chatham-Kent Health Alliance (CKHA). For the first time, this year’s attendees were treated to the sounds of Al Kominek, whose music filled the curling club throughout the day. Participants were also treated to lunch, dinner, a silent auction and 50-50 draw, and prizes for the top teams and top fundraisers. 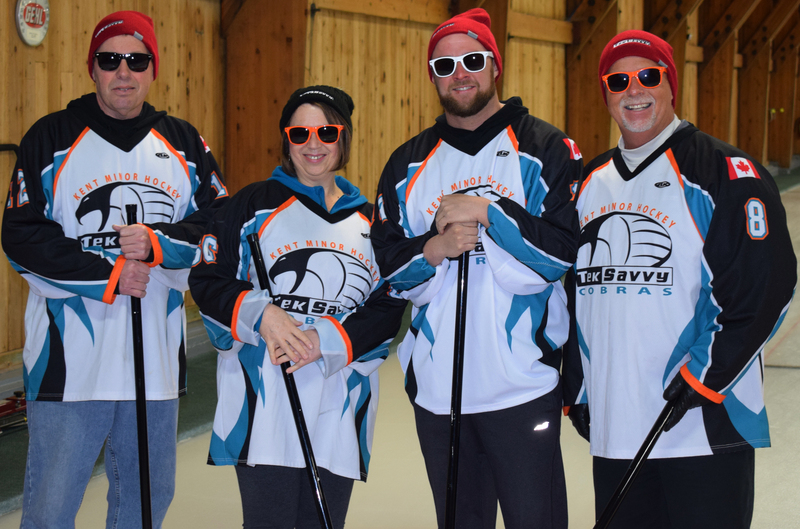 The ultimate winner of the bonspiel was the Negrave-Van Arkel team, and the top fundraising team, as well as the top individual fundraiser, were both from TekSavvy Solutions. The Foundation was also pleased to have new partners in 2019, including Cavanagh Funeral Homes, which not only provided a sponsorship but donated the wine that was served during dinner. Other new partners included Aarkel Tool and Die, Dowler-Karn, North Kent Mutual Insurance, JFK Chartered Accountants, Riversite Realty, and Tim Horton’s in Dresden. Kevin Wise – Express Yourself, a hair salon in Wallaceburg, also very generously donated a large portion of the door prizes and auction items for the event.